This is first big announcement at RootsTech, and it's a game-changer for genetic genealogy! I've played with it for about an hour this morning and am very impressed. 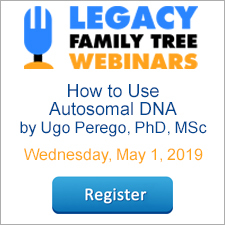 Learn about it below, register for its free webinar, and then check out your new DNA theories in the DNA Matches area at MyHeritage.com. TEL AVIV, Israel & LEHI, Utah--(BUSINESS WIRE)--MyHeritage, the leading global service for family history and DNA testing, revealed today its latest innovation in genetic genealogy — the Theory of Family Relativity™. This technology offers users, for the first time ever, theories that utilize nearly 10 billion historical records and family tree profiles to explain DNA connections. Until now, family history enthusiasts used two distinct domains for making discoveries: the paper-trail world of records and trees, and the biological world of DNA connections. Now, MyHeritage has combined these two domains and integrated them seamlessly. The Theory of Family Relativity™ is based on a big data graph that connects billions of data points drawn from thousands of databases on MyHeritage, in real time. Every node on this graph represents a person, and every edge depicts a blood relationship between two individuals that is described in a family tree or a historical record; or a match between two tree profiles that are likely to be the same person; or two records that are likely to be about the same person. These connections between people and records are established by MyHeritage’s industry-leading matching technologies. MyHeritage engineers and algorithm experts led by the company’s CTO, Sagi Bashari, developed a unique approach that allows the big data graph to instantly compute all paths between millions of blood relatives. The Theory of Family Relativity™ draws upon this resource to construct the most plausible theories explaining how pairs of people linked by a DNA Match on MyHeritage are related, using family trees and historical records. Previously, users who took a DNA test looking to find relatives were faced with puzzling lists of thousands of distant relatives, without many clues explaining the DNA connections. Now, for a growing percentage of these DNA Matches, theories are provided by MyHeritage that explain the precise relationship paths using trees and records. In these theories, not only does genealogy illuminate DNA connections, but DNA also helps separate fact from fiction in the genealogy and shows which tree and record connections appear to be correct. This technology uses millions of family trees on MyHeritage, as well as the World Family Tree on Geni, which is replicated daily to MyHeritage, and the single family tree of FamilySearch, which is also replicated daily to MyHeritage under license. 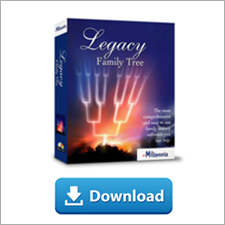 This combination results in the most comprehensive family tree traversal available today. Additionally, the technology utilizes billions of historical records on MyHeritage, including all census records, as well as the MyHeritage Record Detective™ technology that indicates whenever two records are about the same person. For example: a theory that explains a DNA Match between two users can begin in the family tree of the first user, traverse through a series of matching trees into a census record, continue to a household relative, who then matches into another tree, until the path completes with the family tree of the second user. MyHeritage displays the complete path of every theory, and explains every step along the way, allowing the user to verify its accuracy. Each theory is presented with a confidence level that is based on the confidence of the matches used to construct it. The Theory of Family Relativity™ feature is included for free with all Premium, PremiumPlus, and Complete subscriptions on MyHeritage. Individuals who upload their raw DNA data from other testing services to MyHeritage who do not have a subscription can pay a one-time fee of $29 per DNA kit to unlock the Theory of Family Relativity™ and the full range of advanced DNA features offered by MyHeritage. We're Off to RootsTech 2019! The Legacy Family Tree team is off to Salt Lake City for RootsTech 2019! Always the largest family history event, RootsTech 2019 will feature more than 300 classes, thousands of genealogists, and a gigantic exhibit hall. You'll find Dave and Ken - the founders and developers of our Legacy software in booth #1233. I'll (Geoff) be there as well, along with Leonard, Pegi and others (thanks to Michele, Marian, Jairmie, John and Ron for keeping our Facebook, Support, webinars and everything else running at home!). So bring your questions, good conversation, and well, your money. But only bring half as much as you normally would since both Legacy and webinar memberships will be available for our special conference pricing of half off! You'll also find me over at the MyHeritage booth giving demos and short classes. I've also been asked to introduce one of RootsTech's keynote speakers, Saroo Brierley, who was the inspiration behind the true-life story in the movie Lion (I loved the movie!). This will be on the Main Stage on Friday, March 1 at 11am. I'm really looking forward to hearing from MyHeritage CEO, Gilad Japhet, as he has promised to make some industry-changing announcements. Here and here are sneak peeks of the topics, and who knows, there'll likely been even more. "Life is short, do genealogy first!"